Hard to believe that OJ’s former houseguest Kato Kaelin is 59 now, but we have to hand it to him – he sure doesn’t look it! Still boyish and cute, (and he’s still got that HAIR) he’s often in the company of pretty women. Over the years Kato has had an odd assortment of jobs – reality shows, sportscasting, radio shows – he was a spokesperson for GuestHouseRent.com and our favorite – he fronted a clothing line called Slackerwear (inactive wear for couch potatoes.) He’s always doing SOMETHING – after all, he can afford to dine at Craig’s restaurant with his companion, above. It’s been over 25 years since OJ Simpson was found Not Guilty for murdering Nicole Simpson and Ron Goldman, and the only person to come out ahead after this horrible injustice was Kato Kaelin. OJ’s houseguest COULD have been a hero, but he was too scared to reveal all he knew in court. The aspiring actor WAS a huge hit with the press, however, and they couldn’t get enough of him. He made TV appearances and took part in reality shows for years to come. OJ actually gave him a pretty good career. There are 13 Comments. TELL ME WHAT YOU THINK! David Schwimmer is bringing Robert Kardashian back to life for the TV series American Crime Story. With Cuba Gooding Jr as the egotistical OJ Simpson, and Selma Blair as Kris Jenner, it will be hard to resist watching this. That grey streak in his hair is perfection. David Schwimmer, 48, doesn’t look half as happy as his wife Zoe Buckman or his daughter Cleo who’s riding on her mom’s rolling suitcase, as they arrive in London. 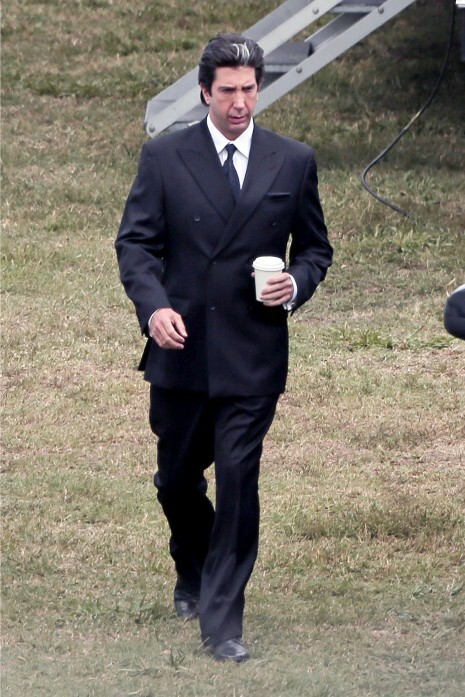 Maybe David is getting into character to play Robert Kardashian Sr in ”The People VS OJ Simpson.” This is David’s first series since “Friends.” The actual series is called “American Crime Story,” and it will feature the most sensational crimes in this country. The first season of ten episodes will tell the OJ story. Charisma Carpenter is playing Nicole Brown Simpson and Shannen Doherty got the part of her sister Denise. But who will play Kato? OJ Simpson is looking forward to costarring on “Anger Management” with Charlie Sheen if he manages to get out of his 33 year sentence at the Correctional Center outside Reno, Nevada. OJ’s rep (yes, he still has “people”) contacted a producer on the FX show about OJ joining the cast and he loved the idea. OJ would play a convict in Charlie’s prison therapy group who’s resentful about his incarceration. When you think about it, it WOULD be hard to resist watching Sheen and OJ onscreen together. But the backstage moments of the two egomaniacs are what interest US. The gossip possibilities are endless. The whole OJ comeback idea depends on two factors: OJ’s early release and the FX network okaying the idea. Still, we’d much rather see OJ languish in jail. 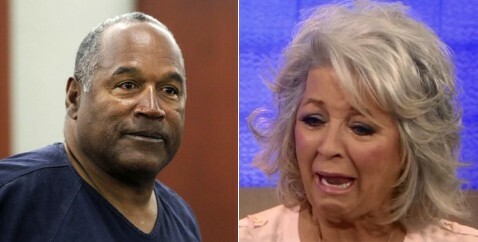 Can you imagine OJ Simpson contacting the National Enquirer from prison to tell them to leave Paula Deen alone? It happened. OJ felt the need to defend her in the racism scandal: “Give Paula a break – she deserves a second chance.” Apparently Paula was extremely HOSPITABLE to OJ when the double murderer visited her restaurant The Lady & Sons in Georgia in 2002! And THAT is the worst crime of all! She served up a banquet for him and simpered that she never believed he was guilty!! What kind of person rolls out the red carpet for OJ SIMPSON? Suddenly we don’t care if they throw the book at Paula- she’s guilty of gross stupidity at the VERY least. And having OJ Simpson in her corner is about as helpful as having Charles Manson on her side. There are 29 Comments. TELL ME WHAT YOU THINK! Whenever we ran into Kato Kaelin through the years, we couldn’t help thinking “You could have been a HERO!” After the OJ Simpson trial we made a point of telling him that, but since then we only think it. He’s a likeable guy but proved himself to be a COWARD when he avoided saying anything during the trial that might make OJ look guilty. For a long time after the trial, he was despised by people appalled by the injustice to Nicole Simpson and Ron Goldman, and fact that smirking murderer OJ was set free. Apparently Kato was scared stiff of telling the whole truth – but if he HAD, he would have been celebrated for the rest of his life for getting a vicious murderer locked up. Kato’s future might have been very different. Last we heard, Kato had an online sports show at FilmOn.com. Meanwhile, we’re curious to find out where Cindy Adams got that quote from Kato in her column today declaring OJ guilty – Kato denies all. There are 17 Comments. TELL ME WHAT YOU THINK! BAD NEWS FOR OJ SIMPSON IS ALWAYS GOOD NEWS ! Have Arnelle Simpson’s feelings about her father OJ Simpson changed? OJ blames HER for the fact that his lavish home in Florida is in foreclosure because she failed to pay the mortgage for two years while he’s in the slammer. He turned his $25,000 a month NFL pension over to his oldest daughter Arnelle, and the mortgage payment was $3,133 a month. According to The Daily Mail, OJ accuses Arnelle of squandering his money on shopping sprees and alcohol consumption. (Can’t IMAGINE where she picked up those bad habits!) A source revealed that Arnelle has lost respect for her father and she is quietly planning to buy a condo in Los Angeles. There are 37 Comments. TELL ME WHAT YOU THINK!